Product #60814 | SKU ST-702HSD | 0.0 (no ratings yet) Thanks for your rating! Features IPS technology, for both accurate colour rendering and a wider viewing angle. 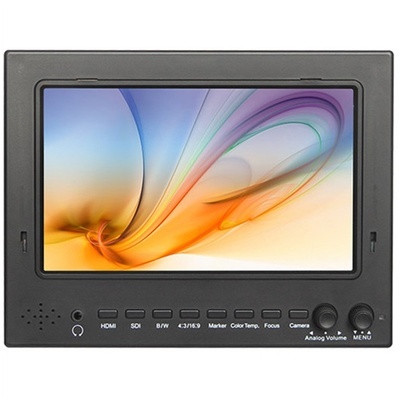 The FeelWorld 7" IPS Lightweight 3G-SDI HDMI Field Monitor with Peaking & Sunshade features IPS technology, for both accurate colour rendering and a wider viewing angle. It supports resolutions up to 1024 x 600 and offers a contrast ratio of 800:1. The ST702-HSD provides both 3G-SDI and HDMI signal loop-through ports, along with a 3.5mm mini headphone jack. The monitor supports peaking function for focusing assist, highlighting image edges in red. The pixel-to-pixel enables the filmmaker to cheque the image from the 1:1 signal source without scaling. In Blue mode, only the blue pixels are used to generate the image, allowing hue and saturation to be adjusted quickly and accurately. The setting knob and six shortcut keys make monitor settings adjustment a quick and easy process.